Returning to the brutal music industry trenches is Iowa’s own metal jugernaught Slipknot. After a much needed break from the insanity’s of touring and the whole exploding popularity of this 9 piece traveling wrecking ball these masked men are back and stronger then ever. With their newest reincarnation Vol 3 (The Subliminal Verses) is a firm rooted album of experimentation daring to out stretch anything they have created in the past. Corey Taylor takes his vocals much further then ever attempted straying from sounding to mundane and repetitive making the Slipknot sound a little more accessible. Not to worry, by no means have these maggot leaders sold out in any way. With the help of famed producer Rick Rubin Slipknot have just taken their dark brand of brash abusive rock and created a whole new realm of extremely heavy metal. Treading into waters that some close minded fans may claim are too commercial for Slipknot Vol 3 (Subliminal Verses) easily is a perfect example of an exercise in the art of maturing as musical artists. Making the transition to the modern evils of Pro-Tools production, Rubin has captured every musician’s sound with out making them sound to programmed and over produced. 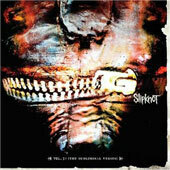 Song after song takes the listener on a mental journey of chaos and brutally that Slipknot have mastered. All the trademark double bass and grinding sounds that established Slipknot as a extremely heavy band are still very prevalent just now they have much more variety to offer. It seems a very intelligent but risky move on the part of Slipknot to expand and dare move out side the waters of what made them such a huge success. Look for Slipknot to return from overseas to pummel crowds all summer as they get set to hit the road with this years installment of OZZFEST.